Kikeyambay West African drum and dance troupe is fronted by master musician Alseny Michel Diallo from Guinea, West Africa, accompanied by N’Nato Camara and Ilana Moon. 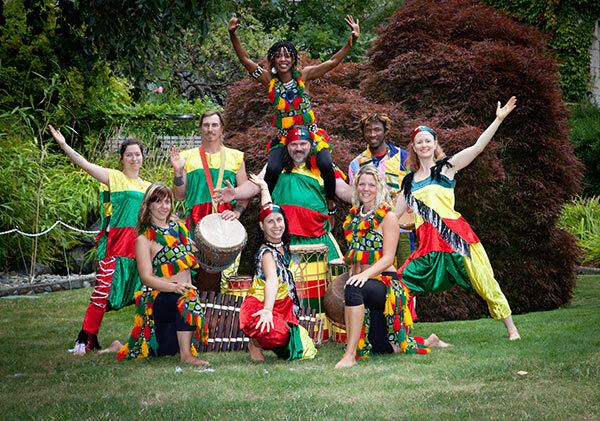 Formed in 2007, this 12-piece troupe brings you tight percussion rhythms, educational cultural stories, dazzling dance pieces and interactive engaging theatrics. Come experience explosive traditional rhythm, song, dance and traditional storytelling of Guinea. They will dazzle you and astound you with their masterful movements and colorful costumes. From the many options of theatrical traditional Guinean stories offered mimicked through dance and music, to the audience participation and invitation to dance and revel in the African way of life, Kikeyambay will sure to bring an element of excitement and joy to any occasion! Take a journey to learn about Guinea West Africa and enjoy the many gifts Africa has to offer. No show is too big or too small! Contact us for more information!